I’ve been waiting for the weather to break so I could test out my new Solo Stove. I’ve been drying to get outside and cook on my new Solo Stove. Today was the day. One bad thing about campfire cooking is the amount of wood you have to gather to make a meal. If I’m just stopping to eat, I don’t want to have cut and haul a ton of wood, just to get a warm meal. This is what makes the Solo Stove perfect. I grabbed a handful of dry sticks, broke them into 3-4 inch pieces and prepared to get cooking. It wasn’t long before I had a little fire going, but would it be enough to boil water? There was only one way to find out, how the Solo Stove would cook, and it was too late to back down now. I had already committed to eating outside today, I had already bragged to my wife. No turning back now! I pulled up my Big Boy Pants and put 16 oz of water in my Stanley Adventure Camp Cook Set Pot and set it on the blazing Solo Stove. I was amazed, I had gathered almost no wood, yet I had a nice little blaze going in a small controlled area. The pot was heating up nicely and the water was starting to bubble, and this had only taken about 5 minutes. Things were looking good so far. hot water in about 5 minutes! I had achieved boiling water. All I had to do now was get 8 oz of this water safely into my Mountain House food pouch and dinner was guaranteed! I was really feeling confident now, and I still had another 8oz of water to spare. 8 oz of water is enough to make coffee….or…. Hot Cocoa! 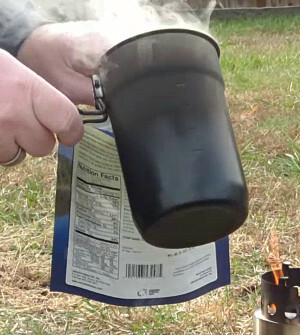 I grabbed one of the cups from my Stanley Adventure Camp Cook Set and added a packet of instant Hot Chocolate. Sweet sweet victory is mine! In about 10 minutes of work, I had gathered sticks, boiled water, made lunch and a hot beverage, not bad, Solo Stove, not bad at all! I didn’t have to chop wood, or gather logs. I ate the Mountain House Scrambled eggs with bacon, and drank the cocoa. The little fire was still going so I tossed in a few more sticks and called for backup. We had to finish testing the Solo Stove. 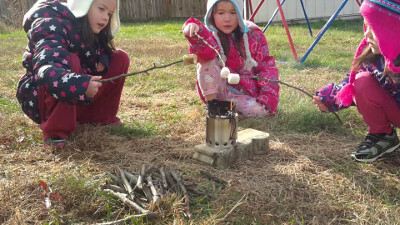 The girls were so well behaved as I tested the Solo Stove, so here’s their reward, Marshmallow roasting! There were still enough sticks left for my girls to roast marshmallows. I even have more than enough sticks left over, to cook something else tomorrow. 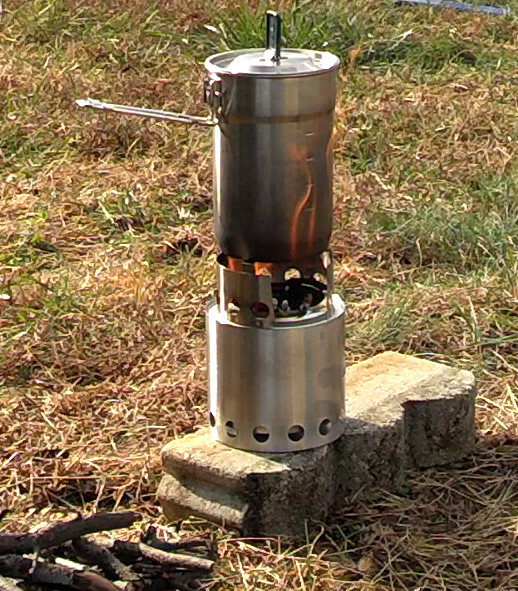 The Solo Stove is a great little stove, that has earned a place in my camping or bug out kit. A tiny bit of biomass (wood, grass, pine cones, etc) goes a long long way! I think this stove will see a ton of use at our house, even when we aren’t planning on camping. How else can I pick up a few sticks and have enough fuel to roast marshmallows or cook a few hotdogs?